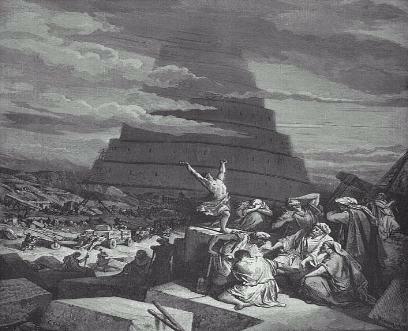 The Tower of Babel - the Beginning of these Systems. civilization - the kingdom of Babylon. survivors to "spread out, and fill the earth" (Genesis 9:7 KJV). Nimrod would become legendary, throughout the secular/pagan world. own. Why? How could these people become so rebellious, so quickly? "fire?" Cush and Nimrod, of course. about any judgment this so-called God might have in store for them. way to heaven, and be able to destroy God with their swinging swords! ploys of power and control in our history. "unity of thought" they learned at the tower, amongst other rebellious ways. Nimrod into their own ways of life! wild animals. He was very strong: a giant in both name and in stature. turned his powerful sights towards conquering people. about to take hold - on a grand scale. so much that they started to revere them as "gods." equate them to gods such as Baal and Merodach (in Judg. 6:25-8, Jer. and only one God - was about to be challenged. We'll see what happened next in Origins of Babylon - Part 2. Henrietta Szold (Baltimore, Maryland: The Johns Hopkins University Press, 1909), 179.
 ibid. p. 23, 28, 31, 41.
 ibid. p. 23-24, 40, 227. 1916), 209, 25-26, 20, 30, 230, 297, 22, 43-44, 46, 56, 314, 49, 246.